At Medicom Health, we understand that one of the most critical measurements of success is the overall completion rates for our HRAs. We are constantly asked for tips and strategic support to increase overall completions. There is one thing that has shown to make a huge impact, and almost immediately – transitioning to the new version 3, or “v3” HRAs. This past year, our team has been hard at work to improve and update our HRAs to be more user-friendly and effective for all clients. Our next generation v3 health assessment was designed and tested based on statistical insights from over a million users and client feedback from more than 700 deployed assessments. With the transition to v3, we are seeing significant improvements in completion rates, especially in the Heart Health HRA. The chart below shows overall completion rates for the Heart Health HRA from January through November of 2018. We selected a variety of health systems based on location, number of hospitals, and overall bed size. 37%v2 (previous) Heart Health HRA average completion rate. 56%v3 (new) Heart Health HRA average completion rate. 1.5x overall completion rate improvement. On average, completion rates improved 1.5 times from v2 to the new v3 Heart Health HRA. 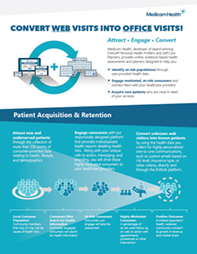 This means more consumers have connected with our hospital clients and converted into patients! Haven’t switched over yet? We are here to help. The transition from v2 to v3 is much easier than you might think. We’ve helped start the process by moving all your customization elements within the portal to the new version. All you need to do now is review the HRAs customization and follow-up plans and change out the link where it lives on your website. You will also notice that the customization process is streamlined and is much more user-friendly and intuitive. Plus, all changes made to HRAs are live immediately – no more waiting for approval on our end. Excited to learn more? We are happy to schedule a demo and walk you through the simplified process. Contact your Client Success Team Member to set up a demo or start the v3 transition process today.